The latest issue of Astronomy & Geophysics includes an article by your truly about the GitHub/.Astronomy Hack Day at the UK’s National Astronomy Meeting in Portsmouth earlier this year. The projects resulting from hack days are often prototypes, or proof-of-concept ideas that are meant to grow and expand later. Often they are simply written up and shared online for someone else to take on if they wish. This ethos of sharing and openness was evident at the NAM hack day, when people would periodically stand up and shout to the room, asking for anyone with skills in a particular area, or access to specific hardware. Yesterday was the Hack Day at the UK National Astronomy Meeting 2014 in Portsmouth. I organised it with my good friend Arfon Smith of GitHub, formerly Zooniverse. We wanted to try and start a new NAM tradition – it went well so maybe we did. I’m psyched that .Astronomy got to help make it happen – not just through my involvement, but the many .Astronomy alumni who attended! Some of the hack projects have already started to appear online, such as Geert Barentsen, Jeremy Harwood, and Leigh Smith (Hertfordshire) who created a Martian Nyan Cat, which is planning to fly over the entirety of ESA’s Mars Express data archive in one continuous, two-day-long, flight. You also grab the code for Duncan Forgan’s beautiful ‘Music of the Spheres’ project, which sonifies the rhythms of planetary systems. Other projects are harder to place online, such as Jane Greaves’ knitted galaxy cluster – with dark matter contributed by many people during the hack day itself. I spent much of the day working with Edward Gomez (LCOGT) on the littleBits Space Kit. littleBits is a modular system of circuits that let anyone try their hand at something that ordinarily requires a soldering iron. littleBits components may be switches, sensors, servos, or anything really, and they connect magnetically to create deceptively simple circuits that can be quite powerful. For example you could connect an infrared sensor and an LED to make a device that flashes when you press buttons on your remote. Or you could use a microphone and a digital LCD display to create a sound meter. The littleBits components are sturdy enough to withstand being bashed about a bit, and simple, and large enough, to let you stick on cardboard, homemade figures, or anything else you find around the house. 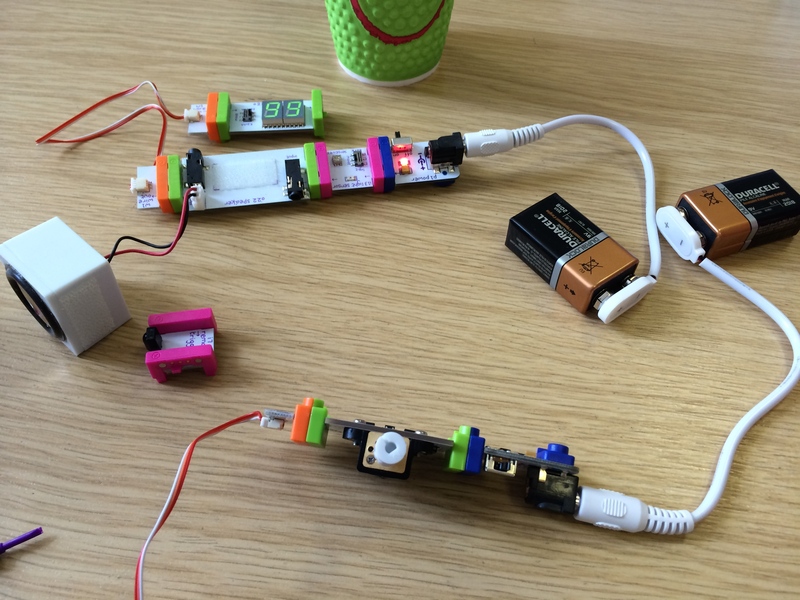 I found out about littleBits when I met their creator, Aya Bdier at TED in March. She is a fellow TED Fellow. We decided fairly quickly to try and built an exoplanet simulator of some sort and ended up crating the littleBits Exoplanet Detector (and cup orrery). There were two parts to this: a cup-based orrery, and a transit detector. The cup orrery consisted of a rotating ‘planetary system’ fashioned from a coffee cup mounted on a simple motor component – we only had hack day supplies to play with – and a central LED ‘star’. Some more cups and stirrers were required to scaffold the system into a stable state but it was soon working. The transit detector used a light-sensor component that read out to both a speaker and a LCD numerical display – Ed refers to this as the laser display board. With a bit of shielding from the buffet’s handy, black, plastic plates the light sensor can easily pick up the LED and you can see the light intensity readout varying as the the paper planet passes in front of the star. It was awesome. We got very excited when it actually worked! You might think that was geeky enough, but it gets better. I realised I could use my iPhone 5s – which has a high-frame-rate video mode – to record the model working in slow motion and allow us to better see the digital readout. We also realised that the littleBits speaker component can accept an audio jack and so could use the phone to feed in a pure tone, which made it much easier to hear the pulsing dips of the transits. Finally, we had the idea to record this nice, tonal sound output from the detector and create waveforms to see if we could recover any properties about the exoplanets. And sure enough: we can! We built several different coffee-cup planetary systems (including a big planet, small planet, and twin planets) and their different properties are visible in their waveforms. Ed is planning a more rigorous exploration of this at a later date, but you can see and hear the large cup planet’s waveform below. So if you want to try something like this, you only need the littleBits Space Kit. You can buy them online and I’d love to see more of these kits, and to see them in schools. I’m now totally addicted to the idea myself too! Thanks to Arfon for suggesting that we do this Hack Day together; to the NAM 2014 Portsmouth team for being so supportive; and to GitHub for sponsoring it – where else would we have gotten all the cups?! Today is the start of the UK National Meeting in Portsmouth. I’ll be there tomorrow, and running the NAM Hack Day on Wednesday with Arfon Smith – which is going to be awesome. 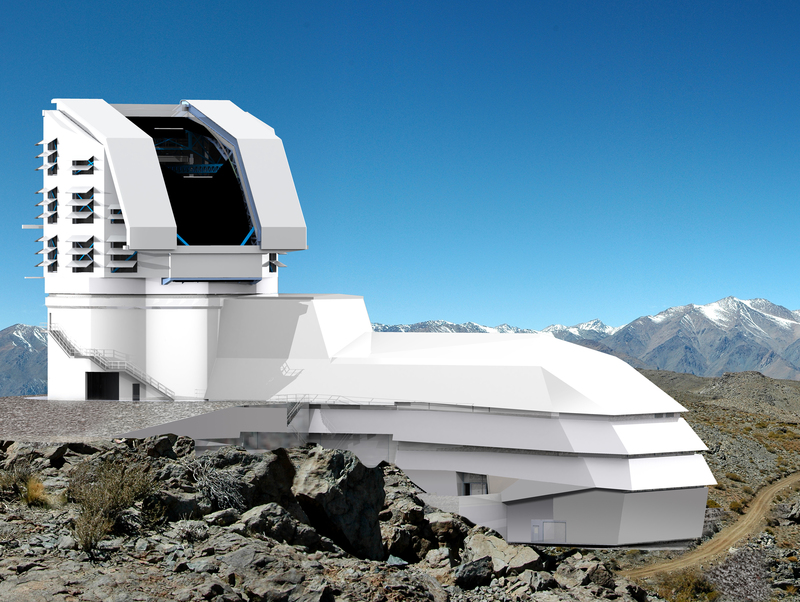 Today at NAM, the nation’s astronomers will discuss the case for UK involvement in the Large Synoptic Survey Telescope project – the LSST. The LSST is a huge telescope, and a massive undertaking. It will change astronomy in a profound way. A photograph and a rendering mix of the exterior LSST building, showing the dome open and road leading away from the site. With every image it takes, the LSST will be able to record very a large patch of sky (~50 times the size of the full Moon). It will take more than 800 images each night and can image its* entire sky twice a week! Billions of galaxies, stars, and solar system objects will be seen for the first time and monitored over a period of 10 years. Crucially it will use it’s rapid-imaging power to look for moving or ‘transient’ things in the night sky. It will be an excellent tool for detecting supernova, asteroids, exoplanets and more of the things that move from night-to-night or week-to-week. For example, the LSST could be used to detect and track potentially hazardous asteroids that might impact the Earth. It will also help us understand dark energy – the mysterious force that seems to keep our universe expanding – by mapping the precise location of billions of galaxies. 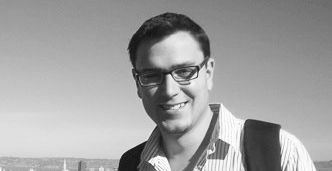 I’ve recently become LSST:UK’s Public Data Coordinator – think ‘chief hacker’ if you prefer. The LSST’s unprecedented archive of data will be a resource we can tap into to create new kinds of public outreach tools, data visualisations, and citizen science. In recent years, we at the Zooniverse have pioneered citizen science investigations of data in astronomy**. The citizen science and amateur astronomy communities around the UK, and the world, will be able to access the amazing data that comes out of the LSST both through structure, Zooniverse-style projects but also in a more freeform manner. The potential for discovery will be on a scale we haven’t seen before. It’s very exciting. The LSST is a public-private partnership and is led by the United States. The unique scientific opportunities presented by the LSST have led to the formation of a group of astronomers from more than 30 UK universities. We’ll be asking for funding from the Science and Technology Facilities Council to support UK participation in the project. If you’re at NAM this week, then I’ve love to talk about LSST, hacking on data, and Zooniverse. On Wednesday you’ll find me in the Park Building, at the University of Portsmouth at the GitHub/.Astronomy NAM 2014 Hack Day. I’ll also be at the GitHub drink up on Tuesday night at The White Swan from 7pm – where you can enjoy some of the finest cask ales, draught beers and wines in Portsmouth – and GitHub are paying! More details at https://github.com/blog/1849-github-meetup-in-portsmouth-uk. ** We’ve now had more than 1 million volunteers pass through our digital doors.